Bandage scissors of Captain Barbara Chiminello from the 71st Evacuation Hospital and 8th Field Hospital. Courtesy of Barbara, Philip, and Eugene Chiminello. Pictured is a pair of bandage scissors. They are made of steel and are 7.5 inches long by 2.25 inches wide. 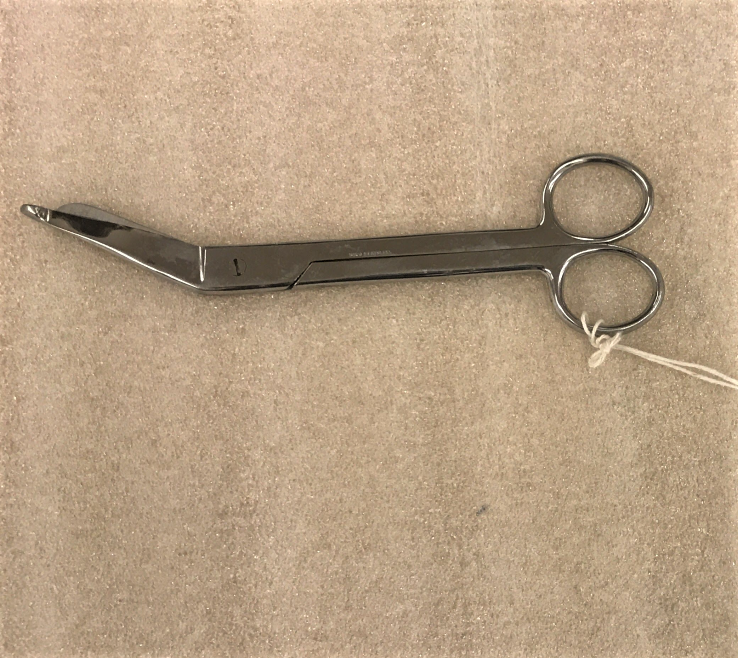 These scissors were used by retired military Captain Barbara Chiminello, who served in Vietnam through the Army Nurse Corps. Captain Chiminello served from 1966 to 1968 for a total of two tours, stationed in Nha Trang and Pleiku, Vietnam. The sorts of injuries Captain Chiminello would have witnessed during the Vietnam War were worse and more numerous than in previous wars. 304,000 Americans were wounded in Vietnam, approximately 300 percent more than in World War II. Due to the guerilla nature of the conflict, soldiers suffered injuries that ranged from gunshot wounds to being hit by shrapnel to losing a limb from explosives. Many of the nurses were somewhat inexperienced in this kind of medicine; nurses, both volunteers and draftees, had rarely seen injuries as severe as these in the United States. However, thanks to the training the nurses received and the speed at which patients were treated, nearly double the amount of soldiers survived in the Vietnam War as in the Korean War. The jobs of nurses and medics ranged depending on where they were stationed. If they were stationed in an area along the coastline and away from where the main conflict was taking place, their 12-hour shifts would be mainly composed of treating benign injuries and administering shots and other medical treatments. If they were stationed in a rural area that was closer to armed conflict, however, the nurses would have to treat the critical injuries that are more commonly associated with the Vietnam War. In addition, the nurses not only treated American soldiers but also Vietnamese civilians. When not on their shifts, nurses and medics would sometimes administer shots and hand out medicine to South Vietnamese people. In the worst-case scenarios, nurses would also sometimes have to treat the injuries that civilians received when caught in crossfire or when injured by an undetected bomb. The nature of American warfare today is very different from American warfare during the Vietnam War. Armed conflicts between the United States military and other organizations today are grouped together under the umbrella of the “Global War on Terrorism” (GWOT), which started in October 2001 with the launch of Operation Enduring Freedom. Because the nature of warfare is different today, army medicine today differs from army medicine in Vietnam. For example, army medicine today is much more involved in healthcare and rehabilitation after a soldier has been wounded than it was during the Vietnam War. Along with treating soldiers on the battlefield, the Army Medicine Corps’ mission includes the aid of veterans and veterans’ families. In addition, approximately 53,000 people have been killed in action during GWOT, while approximately 40,000 soldiers were killed in action in Vietnam; 13,000 more soldiers in just a few years’ time. Thanks to advanced technology in the 21st century, however, army medics are now more equipped than ever to help wounded soldiers on the field. Soldiers. 2010. Accessed July 18, 2017. http://www.deanza.edu/faculty/swensson/bestresearch_womensoldiers.html. Barbara Chiminello interview by Alliyah Nkrumah, Michael Rasin, Luis Reyes, and Madeleine Watts. July 26, 2017, The Vietnam War Oral History Project, New-York Historical Society, New York, New York. “Conflict Casualties.” Defense Casualty Analysis System. Accessed August 08, 2017. https://www.dmdc.osd.mil/dcas/pages/casualties.xhtml. Evans, Diane Carlson, RN. “During the Vietnam Era…” Vietnam Women’s Memorial. Accessed August 08, 2017. http://www.vietnamwomensmemorial.org/vwmf.php. “Vietnam War Facts, Stats and Myths.” US Wings. Accessed August 08, 2017. https://www.uswings.com/about-us-wings/vietnam-war-facts/. Almost everyone has seen Titanic at one point. Whether it’s the music or the iconic romance, Titanic pulls us all in and illuminates a part of history that only our great-grandparents would remember. While the team behind the movie took a few artistic liberties-most notably Jack and Rose’s famous whirlwind relationship- many aspects of the film are accurate representations of what actually happened in the middle of the Atlantic, April 15, 1912.